Reading and share top 86 famous quotes and sayings about No Faith In Love by famous authors and people. Browse top 86 famous quotes and sayings about No Faith In Love by most favorite authors. 1. "God is love;' Creation is the outflow of love. Redemption is the sacrifice and the triumph of love. Holiness is the fire of love. The beauty of the life of Jesus is love. All we enjoy of the Divine we owe to love. Our holiness is not God's is not Christ's, if we do not love. [. . . Again, faith works by love]:"For in Jesus Christ neither circumcision availeth any thing, nor uncircumcision; but faith which worketh by love" (Galatians 5:6, KJV).Faith has all its worth from love, from the love of God, whenever it draws and drinks, and the love to God and man which streams out of it. Let us be strong in faith, then shall we abound in love." 2. "Flowers, cold from the dew,And autumn's approaching breath,I pluck for the warm, luxuriant braids,Which haven't faded yet.In their nights, fragrantly resinous,Entwined with delightful mystery,They will breathe in her springlikeExtraordinary beauty.But in a whirlwind of sound and fire,From her shing head they will flutterAnd fall?and before herThey will die, faintly fragrant still.And, impelled by faithful longing,My obedient gaze will feast upon them?With a reverent hand,Love will gather their rotting remains." 3. "If I speak with the tongues of men and of angels, but have not love, I am become sounding brass, or a clanging cymbal. And if I have the gift of prophecy, and know all mysteries and all knowledge; and if I have all faith, so as to remove mountains, but have not love, I am nothing. And if I bestow all my goods to feed the poor, and if I give my body to be burned, but have not love, it profiteth me nothing." 4. "And though I have the gift of prophecy, and understand all mysteries, and all knowledge; and though I have all faith, so that I could remove mountains, but have not love, I am nothing." 5. "Ivanov: With a heavy head, with a slothful spirit, exhausted, overstretched, broken, without faith, without love, without a goal, I roam like a shadow among men and I don't know who I am, why I'm alive, what I want. And I now think that love is nonsense, that embraces are cloying, that there's no sense in work, that song and passionate speeches are vulgar and outmoded. And everywhere I take with me depression, chill boredom, dissatisfaction, revulsion from life... I am destroyed, irretrievably!" 6. "Do you know about Hanuman, sir? He was the faithful servant of the god Rama, and we worship him in our temples because he is a shining example of how to serve your masters with absolute fidelity, love, and devotion.These are the kinds of gods they have foisted on us Mr. Jiabao. Understand, now, how hard it is for a man to win his freedom in India." 7. "In Christ Jesus neither circumcision nor uncircumcision accomplishes anything; what matters is faith working through love. Galatians 5:6"
8. "Our Lord Jesus does not flatter us. He lets us see our cases as they are. His searching eye perceives the bare truth of things. He is "the faithful and true witness" (Rev. 3:14) who deals with us according to the rule of uprightness. Oh, seeking soul, Jesus loves you too much to flatter you. Therefore, I ask you to have such confidence in Him that, however much He may rebuke . . . you by His Word and Spirit, you may without hesitation reply, "Truth, Lord." 9. "In the broader spiritual realities, no rites or rituals are necessary to know God. NONE. Any religion that insists you can come to intimate knowledge of the Divine by any means other than stillness, self-awareness, and unity with consciousness is deceptive. So-called holy texts are about religion, not necessarily about God. They are really owners manuals for faith traditions. I am not denouncing them altogether, as I love the Bible and have studied it reverently all my life. 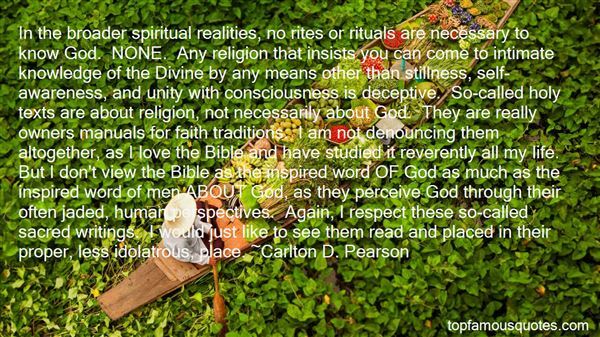 But I don't view the Bible as the inspired word OF God as much as the inspired word of men ABOUT God, as they perceive God through their often jaded, human perspectives. Again, I respect these so-called sacred writings. I would just like to see them read and placed in their proper, less idolatrous, place." 10. "No dependence can be placed upon our natural qualities, or our spiritual attainments; but God abideth faithful. He is faithful in His love; He knows no variableness, neither shadow of turning. He is faithful to His purpose; He doth not begin a work and then leave it undone. He is faithful to His relationships; as a Father He will not renounce His children, as a friend He will not deny His people, as a Creator He will not forsake the work of His own hands." 11. "For me, 'Lamb' started out as a further exploration of the phenomenon of faith and the responsibility of a messiah that I touched on in 'Coyote Blue' and 'Island of the Sequined Love Nun,' but it ended up being an exploration of the true meaning of sacrifice, loyalty, and friendship." 12. "We can reject everything else: religion, ideology, all receivedwisdom. But we cannot escape the necessity of love and compassion....This, then, is my true religion, my simple faith. In this sense, there is no needfor temple or church, for mosque or synagogue, no need for complicatedphilosophy, doctrine or dogma. Our own heart, our own mind, is the temple.The doctrine is compassion. Love for others and respect for their rights anddignity, no matter who or what they are: ultimately these are all we need.So long as we practice these in our daily lives, then no matter if we arelearned or unlearned, whether we believe in Buddha or God, or follow someother religion or none at all, as long as we have compassion for others andconduct ourselves with restraint out of a sense of responsibility, there isno doubt we will be happy." 13. "The choice of the point(s) of view from which the story is told is arguably the most important single decision that the novelist has to make, for it fundamentally affects the way readers will respond, emotionally and morally, to the fictional characters and their actions. The story of an adultery, for instance - any adultery - will affect us differently according to whether it is presented primarily from the point of view of the unfaithful person, or the injured spouse, or the lover - or as observed by some fourth party. Madame Bovary narrated mainly from the point of view of Charles Bovary would be a very different book from the one we know." 14. "The little house is not too smallTo shelter friends who come to call.Though low the roof and small its spaceIt holds the Lord's abounding grace,And every simple room may beEndowed with happy memory.The little house, severly plain,A wealth of beauty may contain.Within it those who dwell may findHigh faith which makes for peace of mind,And that sweet understanding whichCan make the poorest cottage rich.The little house can hold all thingsFrom which the soul's contentment springs. 'Tis not too small for love to grow,For all the joys that mortals know,For mirth and song and that delightWhich make the humblest dwelling bright." 15. "You may have misery," she continued, ignoring my plea, "you may lose hope in the sorrow of an unplanned life but as long as you have faith and trust in adoration, in affection, in love, that sorrow will turn to happiness. And that is a constant, dear." She breathed deeply and steadily for a moment, seemingly catching her breath. "No one can know sincere happiness, Sophie, without first having known sorrow. One can never appreciate the enormity and rareness of such a fiery bliss without seeing misery, however unfair that may be. "And you will know honest happiness. Of that I am certain. Certain because it's why you are here and also because here is your inevitability." 16. "The hardest bones, containing the richest marrow, can be conquered only by a united crushing of all the teeth of all dogs. That of course is only a figure of speech and exaggerated; if all teeth were but ready they would not need even to bite, the bones would crack themselves and the marrow would be freely accessible to the feeblest of dogs. If I remain faithful to this metaphor, then the goal of my aims, my questions, my inquiries, appears monstrous, it is true. For I want to compel all dogs thus to assemble together, I want the bones to crack open under the pressure of their collective preparedness, and then I want to dismiss them to the ordinary life they love, while all by myself, quite alone, I lap up the marrow. That sounds monstrous, almost as if I wanted to feed on the marrow, not merely of bone, but of the whole canine race itself. But it is only a metaphor. 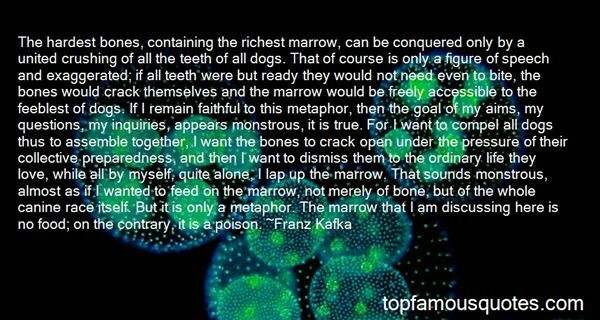 The marrow that I am discussing here is no food; on the contrary, it is a poison." 17. "Do you know I've been sitting here thinking to myself: that if I didn't believe in life, if I lost faith in the woman I love, lost faith in the order of things, were convinced in fact that everything is a disorderly, damnable, and perhaps devil-ridden chaos, if I were struck by every horror of man's disillusionment -- still I should want to live. Having once tasted of the cup, I would not turn away from it till I had drained it! At thirty though, I shall be sure to leave the cup even if I've not emptied it, and turn away -- where I don't know. But till I am thirty I know that my youth will triumph over everything -- every disillusionment, every disgust with life. I've asked myself many times whether there is in the world any despair that could overcome this frantic thirst for life. And I've come to the conclusion that there isn't, that is until I am thirty." 18. "Farther on, in another place, she wrote: ‘Do not consider my words as the sickly ecstasies of a diseased mind, but you are, in my opinion—perfection! I have seen you—I see you every day. I do not judge you; I have not weighed you in the scales of Reason and found you Perfection—it is simply an article of faith. But I must confess one sin against you—I love you. One should not love perfection. One should only look on it as perfection—yet I am in love with you. Though love equalizes, do not fear. I have not lowered you to my level, even in my most secret thoughts. I have written ‘Do not fear,' as if you could fear. I would kiss your footprints if I could; but, oh! I am not putting myself on a level with you!" 19. "[to Jesus] You did not come down from the cross when they shouted to you, mocking and reviling you: "Come down from the cross and we will believe that it is you." You did not come down because, again, you did not want to enslave man by a miracle and thirsted for faith that is free, not miraculous...I swear, man is created weaker and baser than you thought him! How, how can he ever accomplish the same things as you? ...Respecting him less, you would have demanded less of him, and that would be closer to love, for his burden would be lighter." 20. "WaitWait, for now.Distrust everything, if you have to.But trust the hours. Haven't theycarried you everywhere, up to now?Personal events will become interesting again.Hair will become interesting.Pain will become interesting.Buds that open out of season will become lovely again.Second-hand gloves will become lovely again,their memories are what give themthe need for other hands. And the desolationof lovers is the same: that enormous emptinesscarved out of such tiny beings as we areasks to be filled; the needfor the new love is faithfulness to the old.Wait.Don't go too early.You're tired. But everyone's tired.But no one is tired enough.Only wait a while and listen.Music of hair,Music of pain,music of looms weaving all our loves again.Be there to hear it, it will be the only time,most of all to hear,the flute of your whole existence,rehearsed by the sorrows, play itself into total exhaustion." 21. "Had I life to live over, I see now where I could do more; but neighbour, believe me, my highest aspiration is to be a clean, thrifty housekeeper, a bountiful cook, a faithful wife, a sympathetic mother. That is life work for any woman, and to be a good woman is the greatest thing on earth. Never mind about the ladies; if you can honestly say of me, she is a good woman, you have paid me the highest possible tribute..... To be a good wife and mother is the end toward which I aspire. To hold the respect and love of my husband is the greatest object of my life." 22. "For if in careless summer daysIn groves of Ashtaroth we whored,Repentant now, when winds blow cold,We kneel before our rightful lord;The lord of all, the money-god,Who rules us blood and hand and brain,Who gives the roof that stops the wind,And, giving, takes away again;Who spies with jealous, watchful care,Our thoughts, our dreams, our secret ways,Who picks our words and cuts our clothes,And maps the pattern of our days;Who chills our anger, curbs our hope,And buys our lives and pays with toys,Who claims as tribute broken faith,Accepted insults, muted joys;Who binds with chains the poet's wit,The navvy's strength, the soldier's pride,And lays the sleek, estranging shieldBetween the lover and his bride." 23. "Is God present or is he absent? Maybe we can say now that in the center of our sadness for his absence we can find the first signs of his presence. And that in the middle of our longings we discover the footprints of the one who has created them. It is in the faithful waiting for the loved one that we know how much he has filled our lives already. Just as the love of a mother for her son can grow while she is waiting for his return, and just as lovers can rediscover each other during long periods of absence, so also our intimate relationship with God can become deeper and more mature while we wait patiently in expectation for his return." 24. "I know how much you grieve over those who are under your care: those you try to help and fail, those you cannot help. Have faith in God and remember that He will is His own way and in His own time complete what we so poorly attempt. Often we do not achieve for others the good that we intend but achieve something, something that goes on from our effort. Good is an overflow. Where we generously and sincerely intend it, we are engaged in a work of creation which may be mysterious even to ourselves - and because it is mysterious we may be afraid of it. But this should not make us draw back. God can always show us, if we will, a higher and a better war; and we can only learn to love by loving. Remember that all our failures are ultimately failures in love. Imperfect love must not be condemned and rejected but made perfect. The way is always forward, never back." 25. "Now, according to the strength or weakness of his faith in his Savior, so is his joy and peace, so is his love for holiness, so are his desires to know Him more and to serve Him more single-mindedly in this present world. "But"
26. "For the Word of God is not received by faith if it flits about in the top of the brain, but when it takes root in the depth of the heart . . . the heart's distrust is greater than the mind's blindness. It is harder for the heart to be furnished with assurance [of God's love] than for the mind to be endowed with thought." 27. "Orthodoxy is idolatry if it means holding the 'correct opinions about God' - 'fundamentalism' is the most extreme and salient example of such idolatry - but not if it means holding faith in the right way, that is, not holding it at all but being held by God, in love and service. Theology is idolatry if it means what we say about God instead of letting ourselves be addressed by what God has to say to us. Faith is idolatrous if it is rigidly self-certain but not if it is softened in the waters of 'doubt." 28. "The only life I have left to live is future life. The past is not in my hands to offer or alter. It is gone. Not even God will change the past. All the expectations of God are future expectations. All the possibilities of faith and love are future possibilities. And all the power that touches me with help to live in love is future power. As precious as the bygone blessings of God may be, if He leaves me only with the memory of those, and not with the promise of more, I will be undone. My hope for future goodness and future glory is future grace." 29. "Knowing and thinking exist for the sake of love -- for the sake of building people up in faith. Thinking that produces pride instead of love is not true thinking." 30. "I know you lost your faith in me but I still believeCan I make you understand, can I make you seeI am desperate for your love and it's breakin' me"
31. "Our central problem is not sin and guilt, as it is within the monarchical model. For the Spirit model, our central problem is "estrangement," whose specific meaning of "separated from that to which one belongs" is most appropriate. ... For the monarchical model, sin is primarily disloyalty to the king, seen especially as disobedience to his laws. The metaphors used to express the Spirit model suggest something else. For the metaphor of God as lover, sin is unfaithfulness—that is, sin is going after other lovers." 32. "Any father…must finally give his child up to the wilderness and trust to the providence of God. It seems almost a cruelty for one generation to beget another when parents can secure so little for their children, so little safety, even in the best circumstances. Great faith is required to give the child up, trusting God to honor the parents' love for him by assuring that there will indeed be angels in that wilderness." 33. "Catholicism - all the perversions of Christianity - is not a faith of love. It is a faith of fear. Obey, be good, toe the line, and heaven is yours, the first prize in the lottery of eternity. Disobey, react, cut the lifeline, and never-ceasing damnation is the booby prize. The dogma is, love the only god and you shall be safe. Fail in that love and he will not rescue you, not until you crawl and apologize and fawn before the altar. What kind of a religion demands such indignity?" 34. "Why is love beyond all measure of other human possibilities so rich and such a sweet burden for the one who has been struck by it? Because we change ourselves into that which we love, and yet remain ourselves. Then we would like to thank the beloved, but find nothing that would do it adequately. We can only be thankful to ourselves. Love transforms gratitude into faithfulness to ourselves and into an unconditional faith in the Other. Thus love steadily expands its most intimate secret. Closeness here is existence in the greatest distance from the other- the distance that allows nothing to dissolve - but rather presents the "thou" in the transparent, but "incomprehensible" revelation of the "just there". That the presence of the other breaks into our own life - this is what no feeling can fully encompass. Human fate gives itself to human fate, and it is the task of pure love to keep this self-surrender as vital as on the first day." 35. "The three monotheism share a series of identical forms of aversion: hatred of reason and intelligence; hatred of freedom; hatred of all books in the name of one book alone; hatred of sexuality, women,and pleasure; hatred of feminine; hatred of body, of desires, of drives. Instead Judaism, Christianity, and Islam extol faith and belief, obedience and submission, taste for death and longing for the beyond, the asexual angel and chastity, virginity and monogamous love, wife and mother, soul and spirit. In other words, life crucified and nothingness exalted." 36. "Giving tells the Universe that you believe you are provided for. For even as you empty your purse, you fear not. The act alone is a demonstration of faith that you will remain whole, that your coffers will be replenished, and that love is what matters most. And for whomsoever believes these things to be true, it shall become their reality, and abundance shall be showered upon them unceasingly, as if the heavens had opened up." 37. 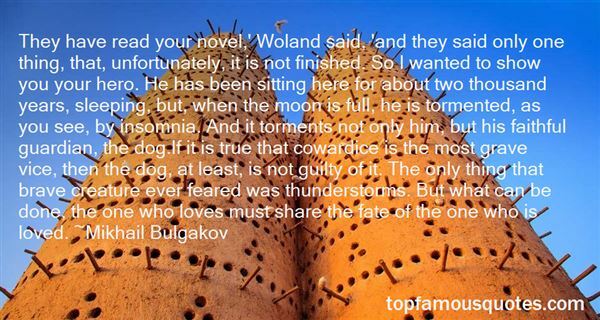 "They have read your novel,' Woland said, ‘and they said only one thing, that, unfortunately, it is not finished. So I wanted to show you your hero. He has been sitting here for about two thousand years, sleeping, but, when the moon is full, he is tormented, as you see, by insomnia. And it torments not only him, but his faithful guardian, the dog.If it is true that cowardice is the most grave vice, then the dog, at least, is not guilty of it. The only thing that brave creature ever feared was thunderstorms. But what can be done, the one who loves must share the fate of the one who is loved." 38. "There,' said Wednesday, 'is one who "does not have the faith and will not have the fun". Chesterton. Pagan indeed. So. Shall we go out onto the street, Easter my dear, and repeat the exercise? Find out how many passers-by know that their Easter festival takes its name from Eostre of the Dawn? Let's see - I have it. We shall ask a hundred people. For every one that knows the truth, you may cut off one of my fingers, and when I run out of them, toes; for every twenty who don't know you spend a night making love to me. And the odds are certainly in your favour here - this is San Francisco, after all. There are heathens and pagans and Wiccans aplenty on these precipitous streets." 39. "If I have the gift of the prophecy, and can fathom all mystery's and knowledge, and if I have faith that can move mountains, but do not have love, I am nothing." 40. "What I have a problem with is not so much religion or god, but faith. When you say you believe something in your heart and therefore you can act on it, you have completely justified the 9/11 bombers. You have justified Charlie Manson. If it's true for you, why isn't it true for them? Why are you different? If you say "I believe there's an all-powerful force of love in the universe that connects us all, and I have no evidence of that but I believe it in my heart," then it's perfectly okay to believe in your heart that Sharon Tate deserves to die. It's perfectly okay to believe in your heart that you need to fly planes into buildings for Allah." 41. "To have Christian hope means to know about evil and yet to go to meet the future with confidence. The core of faith rests upon accepting being loved by God, and therefore to believe is to say Yes, not only to him, but to creation, to creatures, above all, to men, to try to see the image of God in each person and thereby to become a lover. That's not easy, but the basic Yes, the conviction that God has created men, that he stands behind them, that they aren't simply negative, gives love a reference point that enables it to ground hope on the basis of faith." 42. "[Knowing God]... call it love, yes, only that can sound too emotional, or call it faith, and that can sound too cerebral. And what is it? Both, and neither... [its] the decision to be faithful, the patient refusal of easy gratifications... of Jesus' prayer in Gethsemane and on the cross, that bloody crown of love and faith. That is how I learn finally of a God who will not be fitted into my catergories and expectations... the living truth too great for me to see, trusting that He will see and judge and yet not turn me away... That is the mercy which will never give us, or even let us be content with less than itself and less than the truth... we have seen the truth enacted in our own world as mercy, grace and hope, as Jesus, the only-begotten, full of grace and truth.."
43. "But what is the philosophy of this generation? Not God is dead, that point was passed long ago. Perhaps it should be stated Death is God. This generation thinks – and this is its thought of thoughts – that nothing faithful, vulnerable, fragile can be durable or have any true power. Death waits for these things as a cement floor waits for a dropping light bulb. The brittle shell of glass loses its tiny vacuum with a burst, and that is that. And this is how we teach metaphysics on each other. "You think history is the history of loving hearts? You fool! Look at these millions of dead. Can you pity them, feel for them? You can nothing! There were too many. We burned them to ashes, we buried them with bulldozers. History is the history of cruelty, not love as soft men think." 44. "Phoebe asked me, "Tell me, what do you think of the afterlife? "I was a bit nonplussed. I had no idea what she thought, but I knew that the question must be of greater interest to someone of her age than to me. But our conversation had been completely honest, and before I could speak, honesty and tact had joined hands in my answer. "I have no faith at all," I said, "but sometimes I have hope. "I rather think," she replied, "that total annihilation is the most comfortable position. "I was shaken. The horse clopped on. The children laughed behind us.When I die," she said, "I don't expect to see any of my loved ones again. I'll just become a part of all this." She waved her hand at the surrounding countryside. "That's all right with me." 45. "Have faith. Believe.She did.She understood now what fate asked of her-to have the strength to hold on regardless. To acknowledge that, even if he died, even if he left her, she would still love him until the day she died.Love didn't care. Love simply was.Love was unconditional.Love was for ever more.She had faith in love. She believed in love.She would love him in life and in death.And if the chance came again she would convince him of that.As the night closed around her, she closed her eyes and prayed." 46. "Life is such unutterable hell, solely because it is sometimes beautiful. If we could only be miserable all the time, if there could be no such things as love or beauty or faith or hope, if I could be absolutely certain that my love would never be returned: how much more simple life would be. One could plod through the Siberian salt mines of existence without being bothered about happiness. Unfortunately the happiness is there. There is always the chance (about eight hundred and fifty to one) that another heart will come to mine. I can't help hoping, and keeping faith, and loving beauty. Quite frequently I am not so miserable as it would be wise to be." 47. "If God absolutely and pretemporally decrees that particular persons shall be saved and others damned, apart from any cooperation of human freedom, then God cannot in any sense intend that all shall be saved, as 1 Timothy 4:10 declares. The promise of glory is conditional on grace being received by faith active in love." 48. "Love without hope will not survive.Love without faith changes nothing.Love gives power to hope and faith." 49. "Those who love much, do much and accomplish much, and whatever is done with love is done well.... Love is the best and noblest thing in the human heart, especially when it is tested by life as gold is tested by fire. Happy is he who has loved much, and although he may have wavered and doubted, he has kept that divine spark alive and returned to what was in the beginning and ever shall be. If only one keeps loving faithfully what is truly worth loving and does not squander one's love on trivial and insignificant and meaningless things then one will gradually obtain more light and grow stronger." 50. "I think bourgeois fathers – wing-collar workers in pencil-striped pants, dignified, office-tied fathers, so different from young American veterans of today or from a happy, jobless Russian-born expatriate of fifteen years ago – will not understand my attitude toward our child. Whenever you held him up, replete with his warm formula and grave as an idol, and waited for the postlactic all-clear signal before making a horizontal baby of the vertical one, I used to take part both in your wait and in the tightness of his surfeit, which I exaggerated, therefore rather resenting your cheerful faith in the speedy dissipation of what I felt to be a painful oppression; and when, at last, the blunt little bubble did rise and burst in his solemn mouth, I used to experience a lovely relief as you, with a congratulatory murmur, bent low to deposit him in the white-rimmed twilight of his crib." Without initiative, leaders are simply workers in leadership positions."